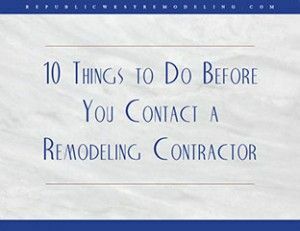 Download our latest guide, “10 Things To Do Before You Contact A Remodeling Contractor ” today! Republic West Remodeling’s latest guide for homeowners is available, so claim your copy now! So, before you begin the contractor selection process, read this guide. You’ll likely avoid a lot of stress that often comes with remodeling a home. And, by having your ducks in a row, you’ll be in a much better position to actually enjoy the experience. For more information on home remodeling, or to request a free, no obligation, design consultation, visit https://www.republicwestremodeling.com/remodeling-and-construction.php or call (480) 478-8700.